Posted on November 1, 2011 by eat healthy. be happy. live well. Today you are in for a treat! Here’s another installment of recipes from my very talented brother. Enjoy! The dinner recipe comes from this month’s issue of Men’s Health with some tweaks to the amounts called for. I loved Blackened anything, and the thought of adding a richness and zing with the butter was just too good of a treat to pass up. *Sorry there aren’t any pictures of this one, I really only had about 20 minutes to get this on a plate before my little nugget woke up from her nap. Well before it’s time to start making dinner pull out the butter and let it get to room temperature, though if you’re pressed for time you can nuke it for about 7-10 seconds to soften it up. Step 1: In heavy bottom stainless-steel or cast-iron skillet, heat the oil on medium-high until it just starts smoking. While the oil is heating up season both sides of your fish, and when the oil is ready place the fish into the skillet. Sear for roughly 4-5 minutes and then turn for another 3 minutes or so. – If you want very subtle, grate/zest the entire lime into the butter mixture, beware this could lead to the lime being completely overwhelmed by the richness of the butter. – If you want a light lime flavor, cut the lime in half and give one of the halves a quick squeeze to get a few drops of lime juice out. – If you want the lime to be the star of the show, entirely juice one half of the lime. Step 3: Plate your tilapia and put a dollop of the butter onto the filet immediately and serve so the butter can melt on top of the tilapia. Serve with vegetables and carb of your choosing, I did a Broccoli, Onion, and Bell Pepper Sauté Medley mixed into some quinoa. When I first read the peach picking post, my mind immediately jumped to dessert though not as rustic and fall oriented as Kristin’s mini Honey-Peach cobblers; instead I thought about the smooth and decadent luxury that is Crème Brûlée. 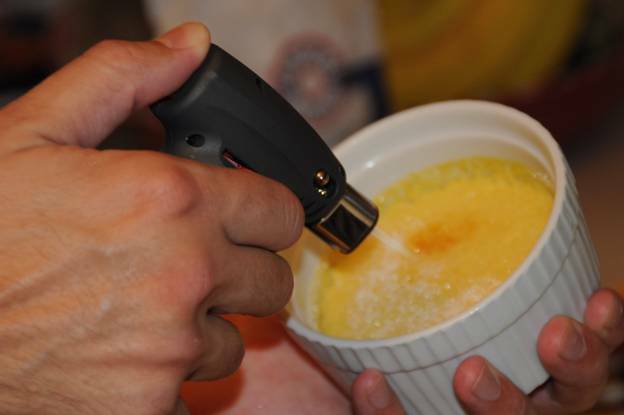 Ever since my freshman year in college, I’ve loved Crème Brûlée, mostly for the flavor and texture, but a little bit of it was because of getting to play with fire while making it at the restaurant I worked at. I found a small brûlée torch (though I do miss the extinguisher-sized blow torch/flame thrower I used to have at the restaurant) and have been making this dessert somewhat regularly at home for my wife. Though, I’ve only ever strayed from the basic vanilla flavor once by adding a pinch of freshly ground coffee to the basic vanilla recipe (gave it a nice crunch and some awesome flavor). However, I’ve been waiting for inspiration to strike and provide me with a soft velvety flavor profile to marry with that rich custardy goodness. Enter Peaches. The second piece of inspiration for my spin on this dish comes from my childhood and my bartending days – you see I loved (and still do) Orange Dreamcsicles or Creamsicles so whilst bartending my way through college I figured out how to make a frozen cocktail that tasted exactly like the orange dreamsicle (Amaretto is the secret). 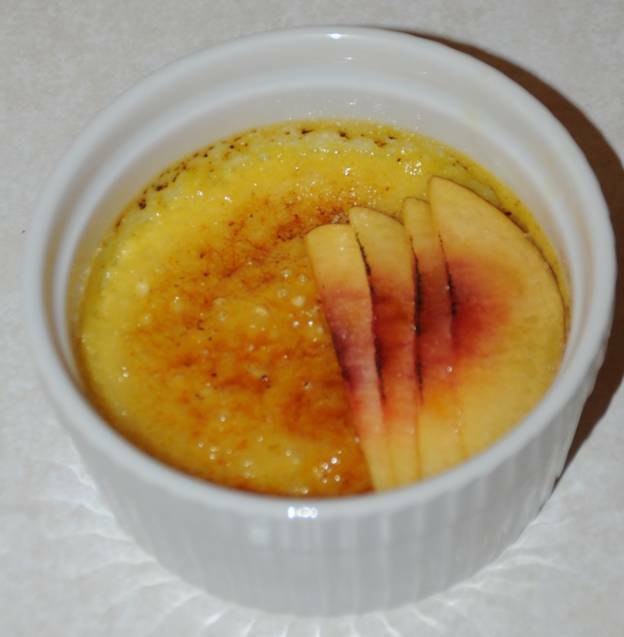 Finally finding my inspiration I created something I’m calling my Nectarine Dream Crème Brûlée, and though my finished product didn’t turn out perfect, I’ve modified the recipe to give you a shot at the perfect dessert. Preheat oven to 300 degrees. Start off by bringing a pot of water almost to a boil. While that’s heating up place the cream and sugar in a sauce-pot on medium heat, stirring some-what continuously until small bubbles appear around the edges of the pot. While everything else is heating up beat two egg yolks until just frothy. 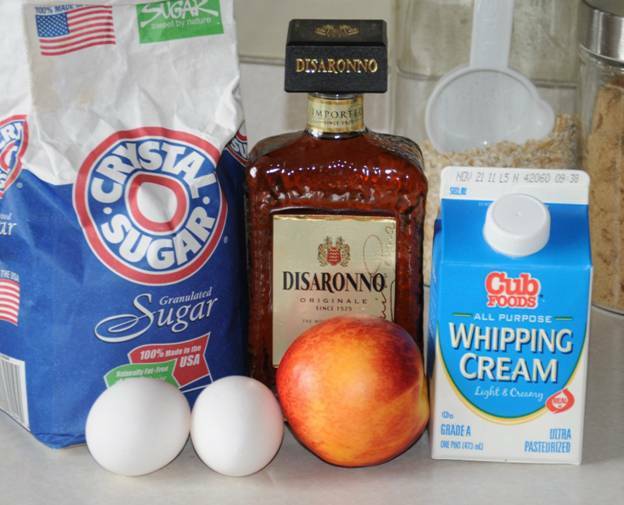 Puree the nectarine pieces with the splash of Amaretto/Almond Extract and add this to the cream and sugar mixture. 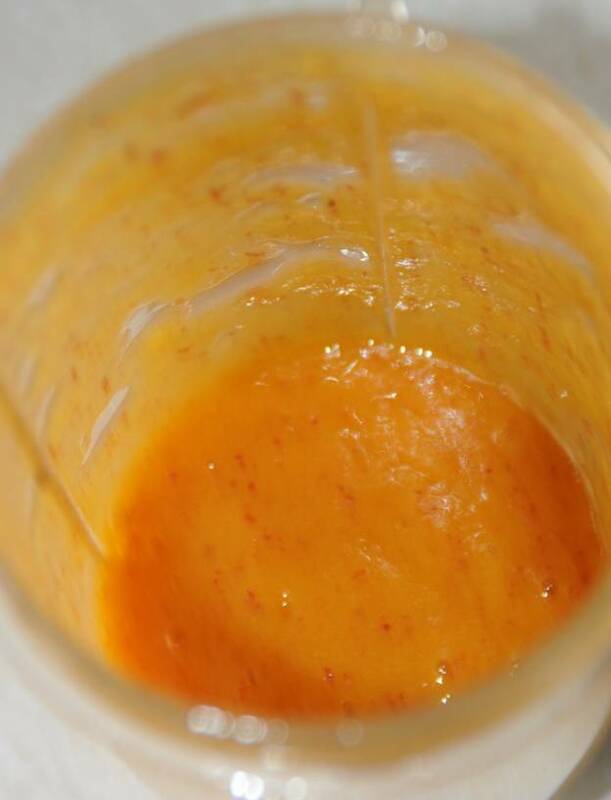 While continuously beating the egg yolks slowly add the cream mixture little by little; if you add too much too quickly the temperature difference will cause the eggs to scramble. Once all of the cream mixture is incorporated into the eggs let sit for approximately 5-10 minutes so the bubbles start to disappear. Strain the entire mixture through a very fine sieve to help remove the rest of the bubbles (this is very important for presentation and texture). I don’t have a fine sieve, nor did I have patience that night due to my nugget wanting some attention. Take out your blow-torch and evenly flame the tops of the brûlées until the sugar starts to turn a beautiful amber color all over – if your torch is weak-sauce, like mine is, tilt the ramekin such that the caramelizing sugar starts to drip downwards which helps raise the temperature of the uncaramelized granules so they can brown quicker. For some extra flair you can fan-slice another nectarine and sprinkle some sugar on the fan for caramelizing as an edible garnish, though you’ll have to use a healthy pinch of sugar – I used too little and only got a tiny bit of caramelization on the edges. Within about 45 minutes of actual work and some sitting around waiting, you’ve just created one of the most decadent desserts found only in the better restaurants, so sit back and savor the delicate flavor and rich, creamy texture. If you prefer the standard vanilla flavor, I suggest switching out the nectarine and amaretto for a single Vanilla Bean. Slice the vanilla bean in half with a paring knife and scraping the vanilla out of the bean pod. You could also add a dash of cocoa powder or finely, freshly ground coffee to the cream and sugar mixture as it’s scalding. FYI – I picked up my torch at Bed, Bath, and Beyond in a “Crème Brûlée set” though do yourself a favor and make sure you get some deep ramekins instead of the shallow ones that come with that set, it’s much easier to keep your water bath out of the velvety goodness if the ramekins are tall. Also, be wary when filling your brûlée torch, the butane often spittles out of the entry point so make sure you test the torch pointing away from the area you just filled it in; this one time…I created a 6 foot fireball in a friend’s kitchen and luckily only singed half of my arm hair and a little portion of my eyebrows. If you haven’t checked out today’s Tuesday Trainer, you’re missing out! I didn’t submit a video this week, but you should still check it out for an awesome workout! 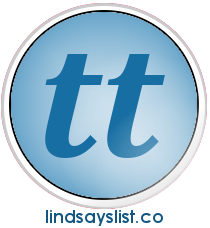 Posted in Dinner, Family, Recipes, Tuesday Trainer, Two Recipe Tuesday. Bookmark the permalink. lol…I’m SUCH a spaz – I would totally set the house on fire with that torch! Thanks for sharing Nick! 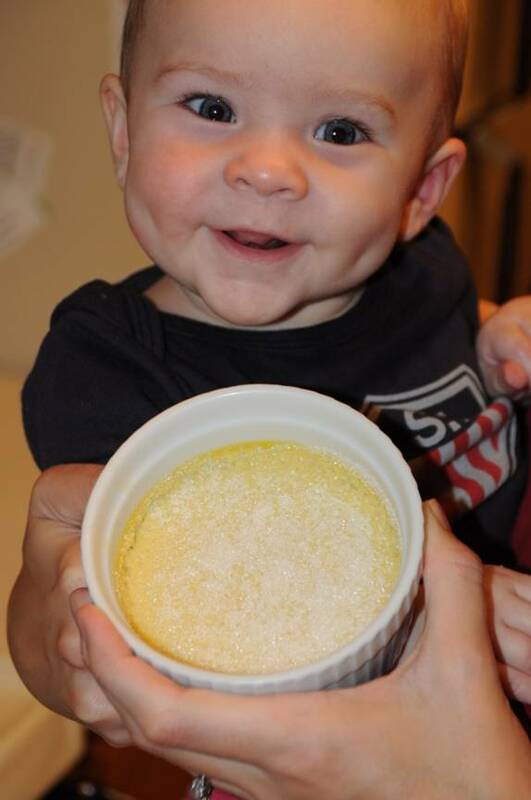 🙂 Recipes look great and that lil’ nugget of yours is ADORABLE!!!! Thank you, she’s quite the little ham when the camera comes out. The recipes ended up tasting pretty good; definitely makes an evening’s dinner at home a lot more fancy. That smile just made my afternoon! So cute!! Thanks for sharing the Tuesday Trainer link. I’ve never seen that and it looks like a really cool resource. both of those recipes sound great! I need to look into that Tuesday Trainer link!